"Hi Max and the rest of the Trio! Thank you so much for performing at our wedding! Your music was beautiful and created a magical day for us!" Pierce Wang - a rising Star! Pierce Wang (14 years old) performed a violin concerto by Julie Conus in E minor with Solano Symphony Orchestra this evening. What a fantastic violinist! Being a concertmaster of the orchestra I have observed Pierces playing very closely. His playing exhibits flawless technique, impeccable intonation and uncanny understanding of musical phrasing. At the end of the concerto which went great, the orchestra and the audience were treated to an encore called "Der Erlkonig" by Heinrich Ernst. This composition is considered to be one of the most challenging pieces ever written for the violin! Pierce breezed thru it like it was walk in the park! What an amazing talent! YouTube has a video of Pierce playing this piece when he was 11! Please check it out! We had a great pleasure to perform at Kara's and Jonathan's wedding in Livermore on September 8th, 2017. This wonderful wedding was held at picturesque Garre Winery. We played several custom arranged songs for the bride and groom including "Drops of Jupiter" by Train! I am happy to report they very were pleased with our work and were kind enough to send us a thank you card! Best of luck to the newlyweds! Max's solo appearance at St.Marks Lutheran Church! Just performed one of my favorite pieces by G.F.Handel, his famous "Largo" from the Opera "SERSE" ( XERXES ). "Largo" also known as "Ombra mai fu", translated from Italian as "Never was a shade". It is a solemn piece, originally written as an aria for the main character, Xerxes I of Persia. Handel finished composing the opera in 1738, unfortunately it did not became popular until almost hundred years after. There are a number of arrangements of this piece for various instruments. We performed an arrangement by Aug. Reinhard for violin and organ. Enjoy! 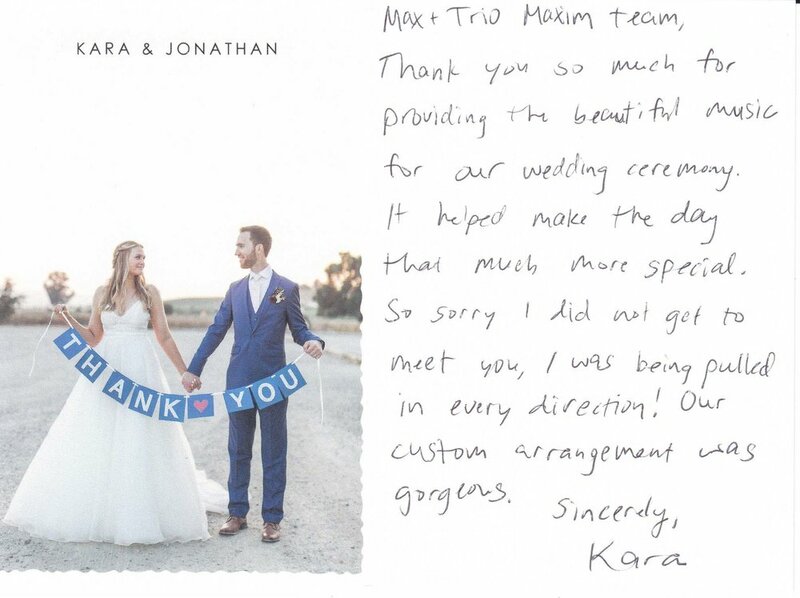 On May 13 Trio Maxim has performed at Laura and Nathans wedding ceremony. The wedding ceremony was held in a scenic redwood grove at the Felton Guild in Felton California, 150 year old town located in Santa Cruz County. It was built on the banks of the San Lorenzo River and is surrounded by redwood tree forest. The newly weds were very excited to hear there favorite song performed for bride's processional at the ceremony. Natasha, our wonderful violinist and arranger has made a custom arrangement of the song "Headlights" by the band The Classic Crime, especially for this occasion. The arrangement turned out great! Trio Maxim wins Best of Gigmasters 2016! We have done it again! Trio Maxim just won Best of Gimasters 2016 award! This is the fifth consecutive "Best of" award for Trio Maxim. We are very proud for this accomplishment and are committed to continue providing an exceptional service to our customers. Trio Maxim is now featured in 2016-2017 Solano Symphony Orchestra brochure! On September 17th Trio Maxim has been fortunate to perform at Nicole and Robert's Wedding Ceremony and cocktail hour. Estate is located in St.Helena on Rutherford Hill directly across from Quintessa Winery. The view, as you can see from the photo, is breathtaking. We extend our congratulations and best wishes to the newlyweds. On August 12, 2016 Trio Maxim performed at Michael and Kendra's wedding at Mountain Terrace, Woodside. It is a small town in San Mateo County, California, on the San Francisco Peninsula and is among the wealthiest small towns in the United States. It is in the middle of redwood forest, the air is crisp and clear. We were playing in the meadow, surrounded by redwoods and enjoying breathtaking view of the valley bellow. We performed well in to the late hours and had a chance to experience the sunset! Mountain Terrace was among the top of our favorite places we had a pleasure to perform at! Congratulations to the newlyweds Kendra and Michael! We are almost at the end of the first week of the Bear Valley Music Festival of 2016! The Festival this year is better then ever with fantastic performances by Festival Orchestra, world renown soloists such as pianist Llewellyn Sanchez-Werner, jazz violinist Mads Tolling, guitarist Mark Aitken and many more. With music by Beethoven, Chopin, Mozart, Haydn, Rossini, Vivaldi, Brahms and others. For tickets please call (209) 813-0554.